Good morning everyone! It’s October already, gosh, the time flies! A month ago I was lying in my bikini on the beach and now the warm clothes can re-emerge. What a difference! But I don’t mind that the warm months are over, because I’m always really excited for autumn. One of the reasons why I’m so happy about autumn are sweaters! I love me some good sweaters! Chunky, wool, refined, turtleneck, cashmere, love them all! They are so comfortable and you can give it a nice tough by, for example, combine it with a statement necklace, blouse underneath or a nice jacket. Every year I’m expanding my sweater collection and I’ve already bought last month some nice ones. As time has passed, I know what my YAY’s and NAY’s are on sweater area. I’m kind of short, so oversized sweaters fits me even more oversized what gives me a dowdy look. Therefore I prefer to avoid them. Also I don’t like too much fuss at a sweater, less is more if you ask me. A itchy sweater is also a real don’t! I’m fan of sweaters that are falling just over my jeans for example and that are made of a nice fabric. Of course, my idea of a good sweater doesn’t need to apply for you, but if you have about the same demands as I do, then this sweater I’ve found last week is probably something for you! Last week I was looking around on MANGO.com when I came across the perfect sweater. It’s nice and soft, warm, has the perfect length and met all my demands. Also a big plus: the sweater was only €15,99. So I couldn’t pass it up. It’s the ‘Alpaca-Blend Sweater’ and it’s available in many different colors. I’ve bought it in ‘gunmental grey’ and ‘camel vigore’. I wanted to share this find with you ‘cause I know that much people are also looking for the perfect sweater. I hope I’ve helped these people with this article. What demands should your perfect sweater meet? Perfect grey knit can take you a long way! That sweater does look nice! I find that they're usually too long or short so the fact this is a good length is great. I'm finally getting into grey too lately, maybe I'll have to check it out! 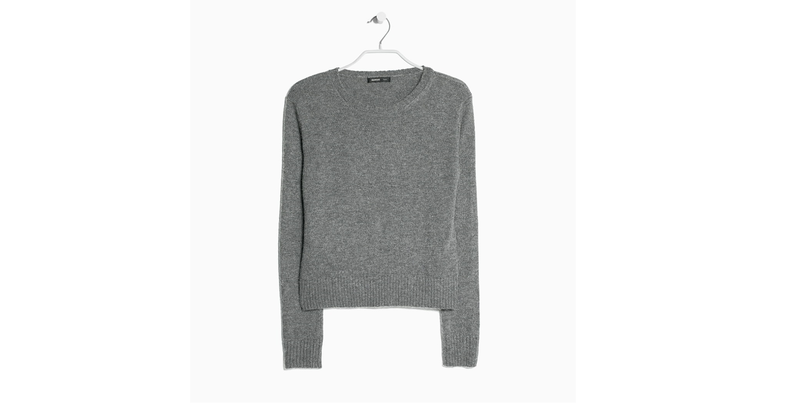 cosy grey sweater? count me in!